When I was a wee girl, I had two posters on my bedroom wall: Michael Jackson in the Billy Jean video, and Rob Lowe in linen pants and a wife-beater tank top, oh so subtly showing off his 6-pack. These days I still find myself drawn to posters of rock shows and swine auctions and old victory garden propaganda. Imagine my joy when I went to the Urban Farm Store in Portland, Oregon and saw these new posters put out by Victory Garden of Tomorrow! Because some friends and I run an urban feed store in Berkeley at the Biofuel Oasis, we ordered a bunch to sell along with the Nikki McClure and Miriam Stahl posters we currently sell. So, this is a poster give away, you’re thinking: what do I have to do to “win” the above poster? Simply come up with the best name for our urban feed store at the Biofuel Oasis. We sell chicken, rabbit, and goat feed in a vintage gas station in South Berkeley. In addition to feed, we sell chicken feeders, founts, canning supplies, cheesemaking kits, supplements like kelp meal, oyster shells, grit, and Diatamaceous Earth. What are your ideas? Best one wins the poster, sent to your house. Howbout “New Reliance Supply Co.”? How about The Farm Fuel Stop? Urban Homestead Feed and Supply? I gotta admit that I think Justin’s ‘New Reliance’ is catchy. Sounds almost like an old wood stove brand. By the way, I go to the Urban Farm Store in Portland for all my organic fertilizers, like kelp meal and rock phosphate. Someday when I have chickens I’ll get my poultry supplies there too. I get to go there when my husband needs to go get beer brewing supplies from FH Steinbart, which is fortunately in the same general part of Portland. We usually hit Pine State Biscuits for breakfast when we go, which make the trip a triple header! I like the first one best. Since it incorporates the two words of your current name, it would still show up in search results if people are unaware of the update. Just a thought… I think I could use some additional coffee as well. Okay, getting a bit silly here …. 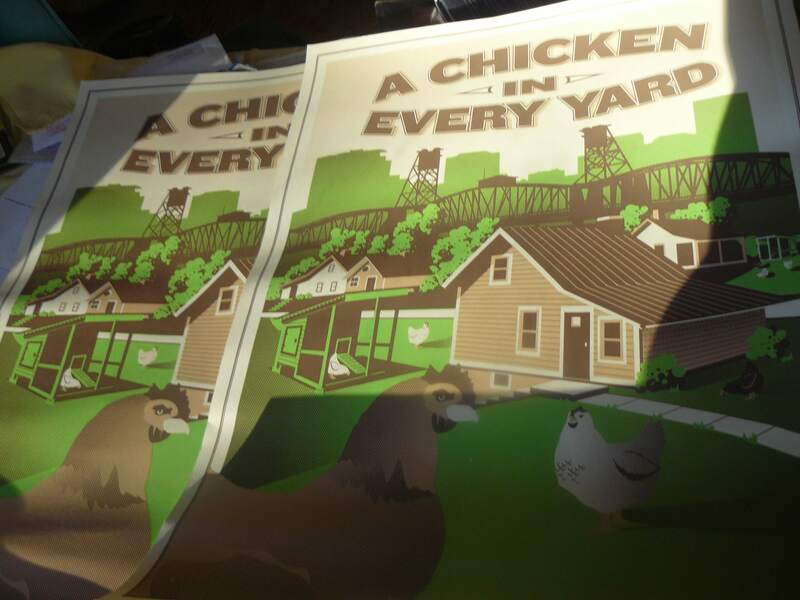 “A chicken in every yard”…..too cool! This is fun! Sounds awesome. That is welcome news. I had no idea I could what I need so close by. I need DE now and feed too. What feed store are you sourcing the feed from? I prefer Modesto Mills or Rivertown. Are you already open for business? 24 hour pet food and leather belts galore! I think i need more coffee too! Chick-fil-Up, like the chicken sandwich chain that you guys have too few of up in NorCal. Btw, our first 7 chicks are shipping out on Wednesday… So excited! I have to admit that I like Urbane Grain that Jessica suggested. I submit City Chicks Emporium-Feed and More. So that would be a simple, retro name. And I love The Farm Garage (at BioFuel Oasis). It says urban farm without saying “urban farm” and it describes your place physically. If you aren’t going with the “at BFO” model, I also really like “Metropolitan Farm and Feed Co. because it’s a new timey twist on old timey. Love the posters, love the names: Urban Farm Fuel and The Farm Garage. Oh my, I had posters of the Jackson 5 and Donny Osmond! Great names everyone. You’re all much more imaginitive than me. Then again they might make better tag lines then names…. I really like Scratch N Stuff though…………. Just keeping it simple and real. Loved your book! b: hos with hoes?!!! i am dying. my college roommate and i used to called each other whores, like, “hey whore, what are you doing tonight?” like with the n word, whores was reserved for our in-group. i like oasis in the title. This is the best comment thread! I keep coming back to check out all the cool entries…. My idea is to focus on who BUYS your stuff. It seems like you support that backyard farmer – both urban and suburban. Farmers might be raising chickens, goats and/or rabbits. And canning and cheese-making. I think the latter is a self-sufficiency dimension. Biofuel Oasis and. . .